On my last day in Zurich, I decided to photograph Grossmunster again, this time from a different vantage point. This time, I wanted the statue of Hans Waldmann in the shot. A hero of the Burgundian Wars, Waldmann led the Swiss Confederates to victory against Charles the Bold. From a humble background, Waldmann eventually became one of the leading citizens of Zurich and was elected mayor of the city. The statue, of a lordly Waldmann on horseback, would have been unthinkable at the time of his death. Though once a military hero, Waldmann’s imposition of high taxes made him unpopular and in 1489 he was overthrown by peasants from the surrounding villages. In April of that year, he was sentenced to death and beheaded. By the twentieth century, Waldmann’s reputation improved. A number of Zurich citizens saw his death as little more than a political assassination. The statue of Waldmann, which overlooks the Munsterbrucke, was unveiled in 1937. I went back to Grossmunster early in the morning. This time, I wanted to photograph the church will all the lines leading to it, making it the focal point of the photograph. 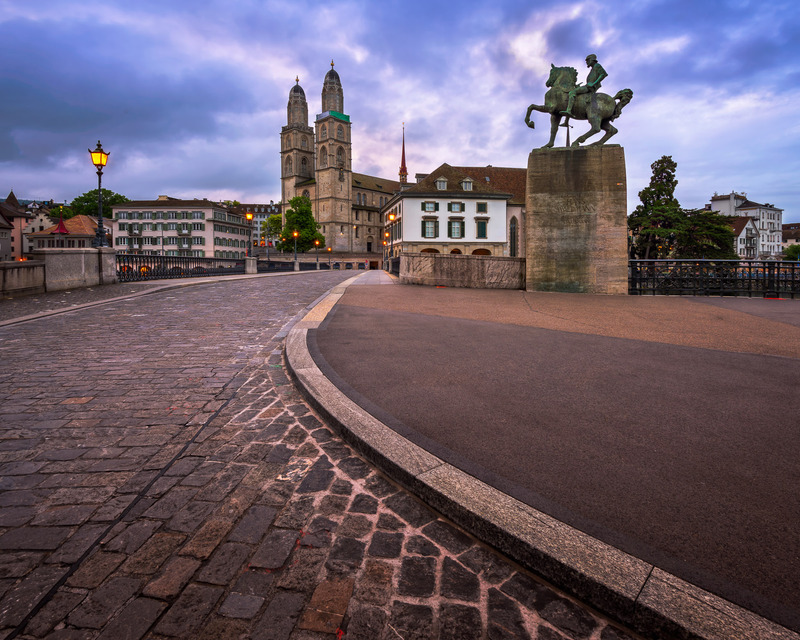 The bridge, its railings, and even the eternally riding Waldmann all focus the viewer’s attention towards Grossmunster.